This spring I have been making some new gardens about the place. The lad has been helping me off and on throughout the process. We started off with making this simple hoop garden. We just took some wire paneling used to reinforce cement and looped it over one of the veggie gardens. There I started some lettuces, dandelions and what not I use to feed the bunnies and occasionally us. :) It worked well. I've repurposed it this summer as a climbing rack for my peas as well. (Just moved it to stand up on end in one cormer of another garden). Where we had our hanging tomatoes last year I put in perennial bed. This started with going to Costco on a day they had their barn board for sale. (woot woot... as I didn't realize that until I arrived there). We took two 10 foot pieces, cut a bit less than two feet off the ends and screwed them together. We then added the best lawn mowers ever created....guinea pigs! We divided the garden in half and put the guinea pigs (we have four) in each section for 12 hours. When we came back the grass was very short and lining the bottom with a thick layer of newspaper was extremely easy. Stage three was added in compost (mostly rabbit manure) and a layer of dirt. My son watered the compost really well as I had some hay/straw mixed in with the rabbit manure. He did an excellent job of compacting it down really well. We layered the top with dirt and then started to grab the perennials out of their holding area in the veggie gardens. I also moved our big planter up on to the corner of the patio and added our household plants (which needed repotting) into it ...this way I only have one big pot to water, and added some other plants just to fill it in a bit. I've probably spent too much at the nurseries this year, but good news is I won't have to spend it next year. I love buying perennials and rarely put in annuals (though I did buy a few this year). For my son and his toad garden I picked up a bunch of scotch and irish moss. We also picked up a variety of ground creeper plants and a couple of quick blooming annuals to encourage flies and what not to come. My son has recently discovered Cacti and HE wants to be responsible for taking care of them. Thusly we have some cactus in our house. We started with these two, but one grandson, convinced his gramma that he needed more AND a pot... so we have three more (but I don't have a picture of them yet). I think it's interesting. My hubby doesn't talk about his growing up years a whole lot beyond the occasional comment here and there. We were talking about my lad's sudden interest in Cacti and he came out with "I liked cacti when I was younger too. Mom bought me some too." What did they tell him? and "I don't remember the rest mom". :) Nine year olds eh? Caring for cacti needn't be challenging. It's like caring for any other plant... water them when they need it, be mindful of pests, repot as necessary and enjoy them. This ﻿site is﻿ really cool. :) Mind if you look through the rest of the site it's rather neat as well... but watching the plant ones had me and my lad spell bound. The touch-me-nots we were familiar with. We met them in a big patch near my mom's house last summer I think it was. It was amazing watching them shoot out their seeds. My son had a lot of fun playing with them, seeing which ones would respond to how hard or how soft a touch, and seeing if we could guess if they were ready to spring forth or not. (not all were). Just a fun plant to play with. I thought this was interesting. What do you think? To go to the original source and to find a video with explanatory text, GO HERE. You know what I think mom? Those hand spa places should have a tadpole option. Make it easy and fun for people. Nature Study. That's the theme of this weeks blog round up. 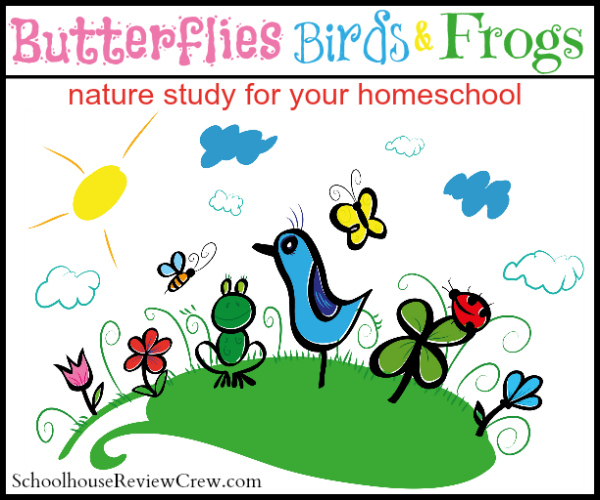 So I thought I would take a moment to share how Nature Study looks in our household. Perhaps you'll take a moment to tell me what it looks like in yours? Sometimes we take walks looking for something particular and then we discover something completely different. Take for instance the day we went looking for Springtails and discovered new life. In our studies of insects, we've learned that having a good bug net, a quick hand, containers to keep them in and sometimes that having a pooter is a very handy thing to have around. In our raising of Mice, rabbits and guinea pigs we have learned many many things. From the study of genetics, to the hardship of birth, to the silliness of mice. We've grown to love some rabbits, and to be cautious around others. Raising all these critters also is helping my son learn how to be a good business person. Sharing his knowledge, making change, figuring out a good pricing system. Now I have to admit, I had mixed thoughts about this book when I first read it. That's me as an adult speaking, my son on the other hand "I like this book mom!". Each page is an animal claiming that it is the most amazing creature in the sea. Good facts about each animal. The animals listed are Leatherback Sea Turtle, Barrel-eyed fish, Mimic Octopus, AnglerFish, Hagfish (this one made us laugh), and seven others. I got a bit tired of the "I am the most amazing creature in the sea" but at the end of the book the question is asked "so which creature is the most amazing?.......YOU decide." So it made the question quite relevant. We each had our favourites of those listed, and for different reasons. My son liked the Anglerfish so we took time to learn more about this fish. Here's a video on the deep sea Anglerfish. And a link to an interesting page on the frogfish. Here's a youtube of them in action. Here's a list of 10 facts you may not know about Hagfish. I have to admit something here, I've had the opportunity to read this book more than a couple times (I did mention that my boy likes this book). :) He can read it himself but it's always more fun to read a book with someone you know? :) The more I read it, the more I appreciate the efforts of the author and illustrator. They did a good job of drawing interest in these amazing creatures, using humour, short facts, excellent illustrations... it's just a well done book. I can totally see using this book while doing a unit study on creatures of the oceans/seas. Letting a child go through and pick an animal or two that they want to learn more about and then running with it. It was my privilege to review this book on behalf of Raincoast books. You can follow them at these links. So tell me... which do YOU think is the most amazing creature of the sea? David FitzSimmons has put together a really pretty book calls "Curious Critters - Marine". I have to admit, I enjoyed looking through this book as I reviewed it. The pictures are just stellar. :) It is his third book in the series "Curious Critters" which has won several awards. My son eagerly picked it up for his daily reading time, and enjoyed looking at the pictures. When he saw the picture below he exclaimed "an urchin!" As you can see, Fitzsimmons did an excellent job of taking pictures for this book. It is 32 pages long of colourful photography and written description. At the close of the book you will find additional information about each of the animals featured in the book, it is a two page spread covering all 18 animals. All the animals in this book being marine animals. As I mentioned, my son enjoyed looking at the pictures in Curious Critters. He enjoyed the brief write ups on the end of the book but was disappointed by the text that accompanied the pictures. He wanted facts, not stories. My son is nine years old. After he commented on it, I took a closer look at the text and understood his disgruntlement. When one expects facts, and one gets a story told from the perspective of the animal, it's a bit disappointing. :) "BUT my lad said. The pictures are really clear, you can see EVERYTHING and that's really cool". Received: Hard Cover book: Curious Critters, Marine. Review done for David FitzSimmons. David FitzSimmons is a photographer. He runs a photography blog. His photography and work can be seen at his website (note mute your speaker if you don't like noise as you browse). His work appears in books, magazine and calendars. He travels around talking about nature, photography and writing. This fellow is a short-tailed bat. They are primarily found in New Zealand in the forest. There are about nine distinct species of them. They are omnivores and are opportunistic hunters, eating whatever they happen to find in their territory. Their wings are very flexible enabling them to hunt on the forest floor as well as hunting insects via flight, or landing on plants to eat from them. They have large pointed ears, and a free tail. They are an important pollinator. Rats and loss of habitat are major threats. "Short-tailed bats are the only species of small bat which carry out lek mating (where males assemble in a special area and compete for the attention of females). During late summer, male short-tailed bats gather at strategic trees near communal roosts and attempt to attract females with prolonged singing bouts"
After we picked our wood (we used scraps from other projects) we needed to put it together. The lad did great with screwing three pieces of the wood, but one piece fought having the screws go in so I helped him with that one. It was good to have him want to do this. Too easy it is to just be a helper and not the actual builder. We came to a realization ofter we fit the pone liner that we made the pond a bit too big. The toads would not have hopping around room. So we needed to fill in a bit of the pond. The lad enjoyed cutting the liner to fit as well. We added a plant, some dirt, lined the edges with bricks, and the added the toads. We have three pairs of toads, but only one pair were put out yesterday. We are hoping they won't escape. If they don't the other two are going out tomorrow. Tomorrow some crickets will be caught for them as well, and meal worms released directly in front of the toads. Hopefully we'll have happy toads, and then pollywogs in the spring. Here toad, want a worm?